When I left college and took my first “real” job, the HR director met with me to talk about benefits. I was 22, in perfect health and very concerned about paying rent and where I was going to go out dancing that weekend. I remember wondering what she was talking about—this “benefits” thing. “You mean like party favors?” I asked. I was picturing swag. Health care and retirement were not on my radar. Having moved on to a few jobs since then, and finding myself working for the International Foundation for the past 18 years, I’ve developed an acute appreciation for employee benefits. Day after day, I’m surrounded by hundreds of articles, seminars and hallway conversations of escalating health care costs and how fleeting a sound retirement is. As I talk with friends and family outside of work and hear them grumbling about their health and retirement plans, I am constantly more appreciative of what the Foundation offers, both in terms of my own edification on these issues, as well as the benefits themselves. Given that we are an employee benefits educational company, of course we have a robust benefit plan. Our leadership has gone to great lengths to ensure that we not only maintain our defined benefit plan, but it is invested wisely and fully funded. We also have a defined contribution plan and regularly have educational opportunities to learn how we can make wise choices that meet our individual goals. By working here, I’ve also been thankful for the generous health coverage that we’ve been afforded over the years. I’ve learned to make wise choices with my health care, like not going to the ER if I think I might have strep throat—An urgent care clinic is much less expensive and usually faster. Enjoying a yoga break in the orchard. In addition to the benefits themselves, coming to work here every day has its perks. I’m encouraged to get away from my desk and walk along our beautiful wooded drive to clear my head. The other day I was meeting with my boss when he shooed me out of his office so I could go lead my co-workers in a yoga class out in our orchard. 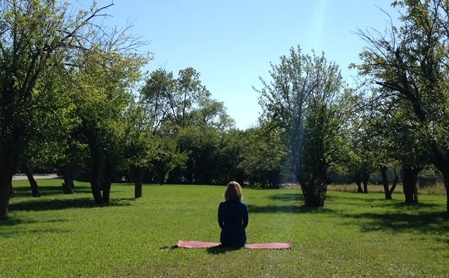 That’s right—I work where we can do yoga in our orchard and my boss, who has high expectations of work performed, sees the value of taking an exercise break during lunch. A few weeks ago we had a company picnic (also in the orchard), where we were entertained by one of our very talented customer service reps who plays in a great cover band. I enjoyed a much-needed belly laugh as I watched my co-workers awkwardly, with ferocious competitive spirit, try to win backyard preschool games. 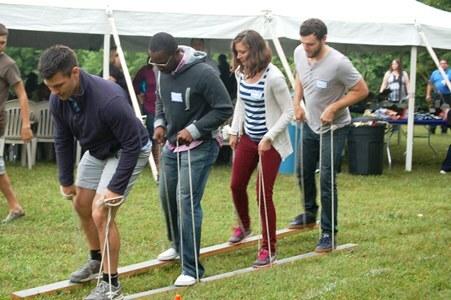 Fun and games at the Foundation company picnic. Over the past few years, thanks to a volunteer group of staff who create these events, these types of activities happen often. And rather than detract from the work, they help staff blow off steam and bond with their co-workers. This creates more productive teams. We communicate better with one another and can simply get more done. 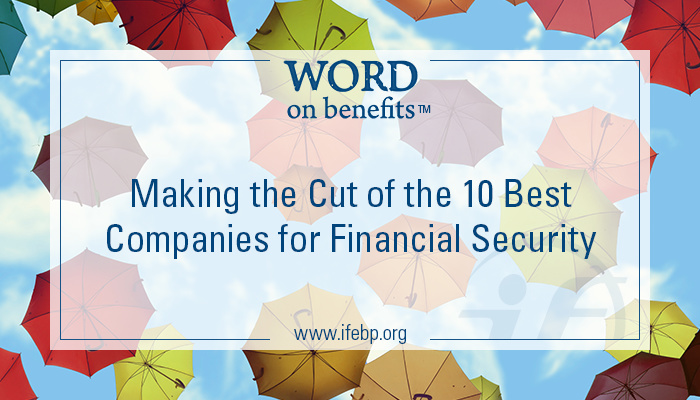 Because of this, and so much more, the Foundation was recently selected as a Principal® 10 Best Companies for Employee Financial Security. This is a national award judged by an independent panel of benefit experts. The application process was quite thorough, as it dug into the nitty-gritty of our plan structure. Winning this national award is a huge honor. The security of working for this company helps me rest easy, and work harder.